three + = 10 Required Please enter the correct value. Many large companies have warned investors to temper their expectations for the end of 2015, as well as the start of 2016, as sales decline or remain stagnant. Money Morning Chief Investment Strategist Keith Fitz-Gerald stated that as of earlier this week, 41.5% of companies reporting earnings have beaten revenue estimates for Q3. That's down from more than 70% in late 2009. Companies from Twitter Inc. (NYSE: TWTR) to J.C. Penney Co. Inc. (NYSE: JCP) have laid off as much as 9% of their workforces in October in an attempt to control costs. According to The Wall Street Journal, Fastenal Co.'s (Nasdaq: FAST) Chief Financial Officer Daniel Florness told investors earlier this month that the industrial environment's in a recession. Many investors have a hard time placing faith in a company that doesn't sell a physical product (this will change with Oculus Rift), and some investors find it challenging to wrap their heads around how Facebook makes money. First, it's important to understand how Facebook makes money. You see, Facebook makes money from companies paying Facebook to place advertisements on its site. A key to that is reaching active users – and having lots of active users to target. In July 2015, Fortune reported that Facebook had more than 1.31 billion mobile monthly users (MAUs) and 844 million mobile daily users. 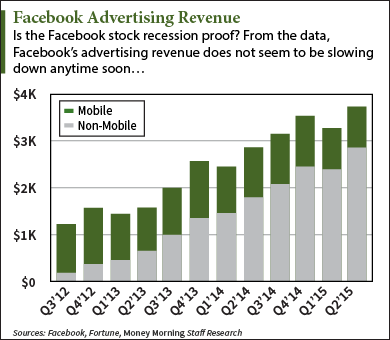 Mobile advertising for Facebook has seen a meteoric rise since Q3 2012. Even in a recession, people are likely to stay active on Facebook – it's a free service. Chief Executive Officer Mark Zuckerberg stated in Facebook's Q2 2014 earnings that the average U.S. consumer spends at least 40 minutes on Facebook per day. Worldwide, Facebook reported that people spend an average of 20 minutes on Facebook per day. One of Facebook's advantages over other social media platforms was its early adoption to mobile technology through interactive ads and videos. Over the next few years, incorporating mobile ads and mobile technology will be a crucial component of any advertising budget. Facebook is slowly rolling out a "Buy Now" option that will let Facebook users purchase a product without ever leaving the site. Advertisers for retail companies will solve the issue of getting people to stores and malls when gas is expensive, unemployment is high, and wages are stagnant.